Did Obama "Set the Tone" for Bipartisanship? Can Obama's Energy Proposals Please the GOP? GOP Response to Obama on Bipartisanship: "Really?" It was Thomas Jefferson who called for "A wise and frugal Government which shall leave men free to regulate their own pursuits of industry ….and shall not take from the mouth of labor the bread it has earned…" He was right. All Americans agree, that a young person needs a world-class education to compete in the global economy. As a kid my dad told me, "Son, to get a good job, you need a good education." That's even more true today. And no government program can replace the actions of caring Americans freely choosing to help one another. The Scriptures say "To whom much is given, much will be required." As the most generous and prosperous nation on Earth, it is heartwarming to see Americans giving much time and money to the people of Haiti. Thank you for your ongoing compassion. 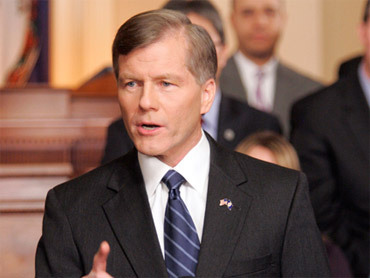 Bob McDonnell: The Government Is "Trying to Do Too Much"
Leaders Promote Bipartisanship... In Their Wardrobe? An End To "Don't Ask Don't Tell"?